I have to admit that marrow isn’t my favourite vegetable either, and I would certainly never bother to buy one myself. Apart from anything else, I’m never very sure what to do with them. So, when a friend last week gave me an enormous – and actually very beautiful – marrow that was grown by a friend of hers, my delight in being given some wonderful home-grown produce was tempered ever-so slightly by my concern over what I might do with it. In the end, of course, I’ve had a great time looking for suitable recipes. Unfortunately, I didn’t think to take a photograph before I started slicing and dicing, and I’m convinced that I won’t be able to give an adequate impression of just how large it was. So, all I can say is that it was, well, large. Anyway, in the end I decided that the only satisfactory approach was to divide and conquer, and I carved it into three roughly equal portions. One of these sections has been blanched and frozen for future use, so if anyone has a suggestion for other interesting marrow recipes, then it would be really great to hear from you. 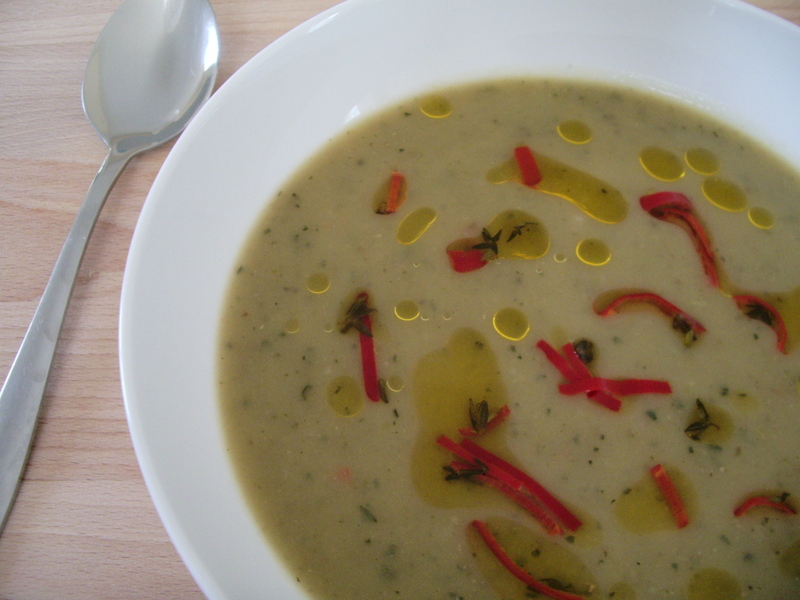 The second was used to make this tasty and warming soup, which really does seem perfect for this time of year, as summer days begin to give way to something more autumnal. I currently have plans to stuff the remaining third, and if all goes well, I’m hoping that it will feature in an upcoming post. If you’ve got the time, then it’s straight-forward to make your own chilli oil. Put 4 red chillies (deseeded and sliced) in a small saucepan with 200ml olive oil, a few sprigs of thyme (leaves only), and 1 garlic clove (unpeeled). Heat slowly until the oil is simmering very gently and cook the chillies until soft, about 20 minutes. Remove from the heat and cool. Once made, the oil will keep, sealed in an airtight container in the fridge, for a couple of weeks. This entry was posted in Food, Lunch, Recipes, Seasonal, Soup, Starter, Vegetables and tagged courgette, marrow, zucchini. Bookmark the permalink. Thank you for sharing! I absolutely adore marrows and I’ve been wanting to make a chilli oil so now recipe is at hand, great! You’re welcome! 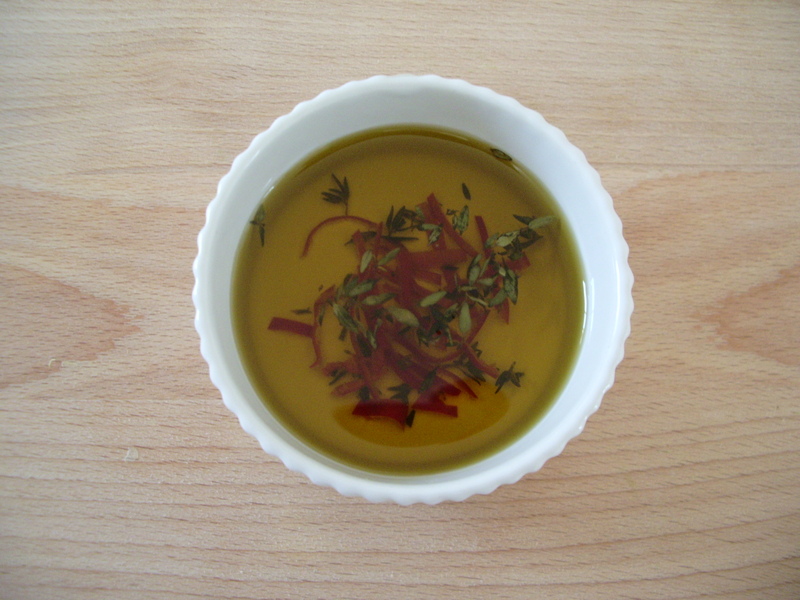 It’s a very quick and easy chilli oil recipe, but seems to work quite well. Last season I had way more zucchinis than I could eat or shove into peoples pockets. I’m always after new ways to devour them. Cheers! lol! I love the idea of shoving marrows into people’s pockets. Sadly, there is no way that this one would have fitted into even the largest of them…!! I hope that you enjoy it Cate. You’ve certainly got plenty of beautiful courgettes to experiment with! Excellent! That’s really great to hear, and I’m glad that you enjoyed it. Thanks for your comment Helen. It’s a great quote, isn’t it! 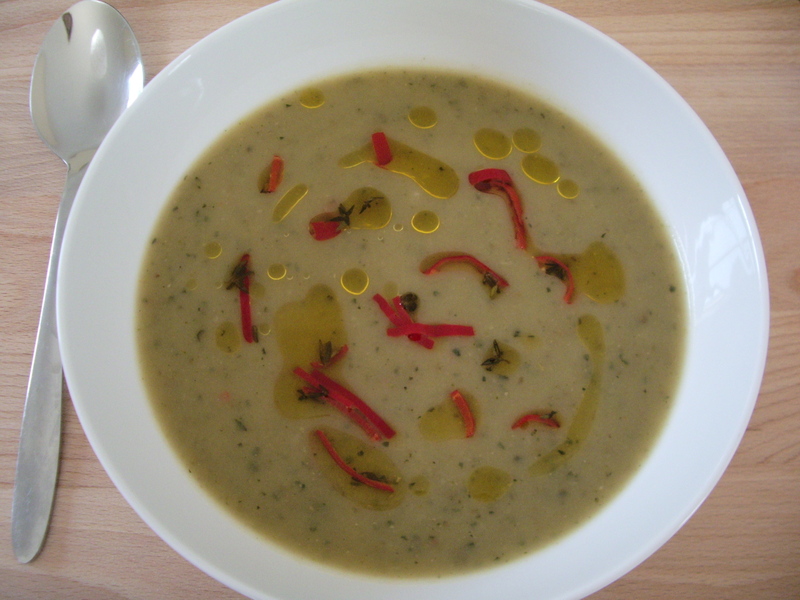 A friend gave me a big marrow he’d grown and the BBC recipe site was unhelpful on the subject of what to do with it, so I Googled ‘marrow soup’ and your recipe came up – thanks for the ideas! That’s really lovely to hear! I’m glad that the recipe was helpful. I intend to make this souptight now! Will possibly leave out the chilli. I am being supplied with marrows by a firend. Such an old fashioned vegetable. Apart from stuffing, marrow makes good jam with jinger and my mum used to fry it with a ‘fry up’. Thank you. I hope that you enjoyed it! It’s true that marrow seems old fashioned these days, but I really like the sound of your suggestions – especially using it in a stir fry, which definitely gives it more of a contemporary twist.